A police officer at the airport in Vladivostok, policeman Vitaly Baklanov, found an expensive cell phone left in the metal detector frame. A tourist from the People's Republic of China who visited the city of Vladivostok as a tourist, while passing through the metal detector, laid out personal belongings containing metal, and after passing through the inspection, she forgot to pick up a cell phone of an expensive brand and remembered it only after 30 minutes. Vitaly found the thing left behind, report to the linear police department. In several minutes, the transport policemen found the owner of the expensive gadget and returned the phone to her. The girl thanked the policeman for vigilance and asked to make photo with him. 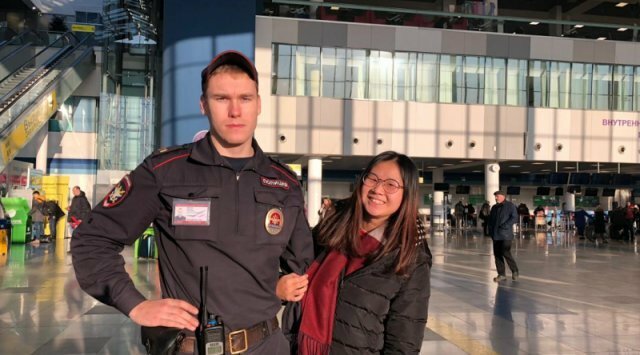 Policeman Vitaly Baklanov is a police officer of the Line Division at the airport in Vladivostok, during his service has many rewards for conscientious performance of his duties.